UK, 1974, 98 minutes, Colour. Oliver Reed, Richard Attenborough, Elke Sommer, Gert Froebe. Adolfo Celi, Charles Aznavour, Stephane Audran. Agatha Christie's reputation and her ingeniously devious plotting will draw audiences to this film. However, while the mystery will keep the uninitiated happily guessing (and this is a basic satisfaction) the screenplay and acting are rather ordinary. A vast desert, Iranian hotel, with a quota of English and French visitors (guests of Mr. U.N. Owen), stars like Oliver Reed, Richard Attenborough and Elke Sommer who are rapidly murdered off, is an exotic setting. There is a double mystery ? who is doing it and who will be next? Sufficient clues are given for the alert, but there are a number of far-fetched touches which means that this is a far less stylish film than the Orient Express. 1. The appeal of murder mysteries, mystery, murder, clues, solutions? 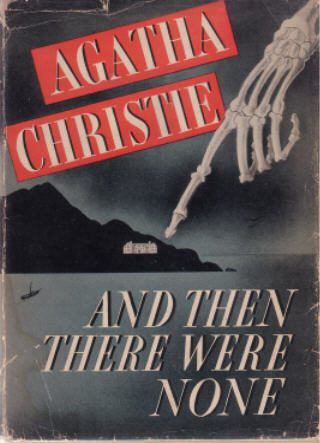 The appeal of Agatha Christie's stories? The appeal of this novel and its status as a classic over the decades? Many film versions? In what lies its principal appeal? 2. Murder mysteries and the atmosphere of the 70s, the success of Murder on the Orient Express and other Agatha Christie stories? The quality of this film? 3. The ingenious nature of the basic idea for the plot, the characters chosen, the situation of justice and retribution, the deaths of each of the characters and an atmosphere for mystery? The idea and the themes involving audiences, identification, rejection of the characters? Sufficient clues given, Agatha Christie's trick? 4. How important was the theme of justice, the rights against murderers and their escaping justice and execution? 6. The choice of the stars and what they contributed to their roles? Expectations of style and manner? Especially Oliver Reed, Richard Attenborough, Charles Aznavour and his actually singing one of his songs? 7. Response to the voice (Orson Welles) and the information about the reason for the gathering in the hotel? The effect on the audience for interest? The effect on the guests and their suspicions of one another, their consciences, to knowing the accusations? 8. How did the film build up the suspense and atmosphere? Sufficiently well? For the audience, for the victims waiting for the next one to go? The nature of suspicion and the reasons for it? A presentation of fear, fear of conscience, death and retribution? Hostility and hatred? 9. How ingenious were the deaths and the variety of deaths? Appropriate for this kind of mystery thriller? How well delineated were the characters? Was their guilt clear? Their confessions? 10. Hugh and Vera being eliminated from the main group? The importance of their final confrontation? The trick and later revealed that they had planned this against Mr. Owen? (in the original novel the two were as guilty as the others and died. Would this have been more effective for the impact of the film?) Does the cinema audience need the possibility of a happy ending? How would this affect the mood of people at the end of the film? How would it have changed the themes? 11. The personality of the Judge, his presence at the arrival, during the deaths, the trick of his own death, his motivation and madness? What right had he to do such executions? 12. The bringing in of the police, Martino and the desert, the revelation of the truth? A tidy ending for the film? 13. Entertainment value? The light touch with important themes of death and retribution?